360 = 23 x 32 x 5. 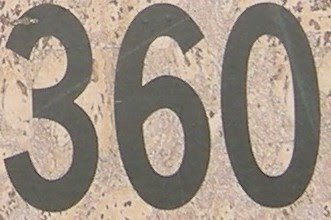 360 has a representation as a sum of two squares: 360 = 62 + 182. 360 is the largest number out of two (the other being 36) that have the same number of letters in its Roman numeral representation (CCCLX) as its double (DCCXX), triple (MLXXX), quadruple (MCDXL), quintuple (MDCCC), sextuple (MMCLX), and septuple (MMDXX). 360 is the smallest number divisible by every natural number from 1 to 10 except 7. One of the divisors of 360 is 72, which is the number of prime numbers less than 360. 360 is the sum to two twin primes: 360 = 179 + 181.